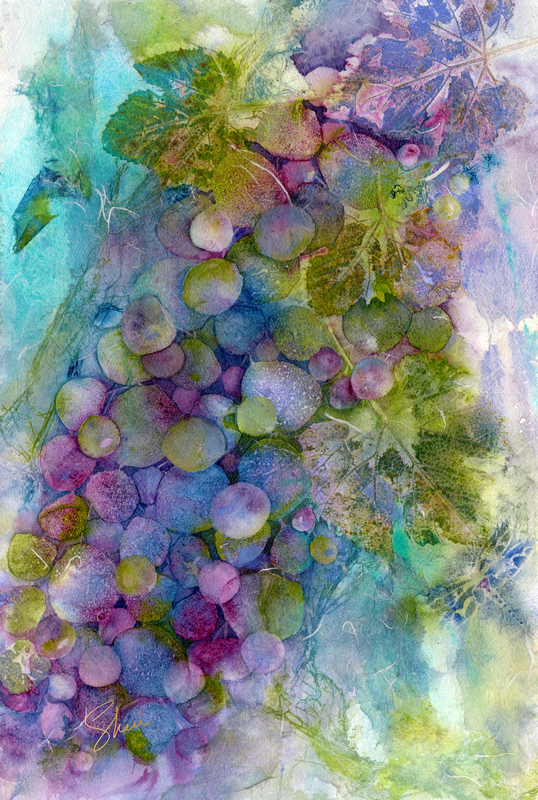 "Plentiful” by Sheri Trepina. Watercolour Collage, 22” x 15”. Copyright 2017 Sheri Trepina. Used by permission of the artist. Artists often have a complicated relationship with money, especially as solo entrepreneurs. Many are confused about monetization, what to charge and how to build sales volume. Sometimes, it’s because fear of rejection leads to insecurity about pricing. Other times, in an effort to beat your competition you undercut prices regardless of profit margin. Yet, in the end, you don’t make money. And you may wonder how your work is perceived in the marketplace, who your target customers are or how much those customers are willing to pay. Consequently, you may not be earning what you’re worth. The prices you charge for your artwork depend partially on your sales history and collector demand. Yet, there are other factors that influence the perception of value, the price and the desirability of your work. Consider using these strategies to heighten the perceived value of your work, allowing you to raise your prices and increase your sales. Buying a work of art is more than just making a purchase. It’s an exciting experience for the customer who may want to know more about you, the creator. People buy from people. Your story is fascinating to them. Your well-crafted artist story enhances that buyer’s experience, and adds value to the art you’re selling. Many collectors are creative people themselves. But instead of making art in the studio, they express their creativity by purchasing and displaying art in their homes or offices. Because they live with your art, it becomes very personal to them. They love the “why” behind each piece. Collectors will remember your story, and share it with others when showing them art they have acquired. Have you traveled extensively, photographing remote and beautiful places? Are you working in an old barn that you converted into a printmaking studio? Tell your story in face-to-face conversations, in your marketing materials, on social media, through email or direct mail to your customers and prospects. Each story you tell helps to create emotional resonance with your audience, making you and your work memorable, distinctive and desirable. If you are at a loss for what to say about yourself, share your process. Show and tell prospective buyers what you do in the studio. Once they see how complex and interesting your process is, they will appreciate it more fully, and often justify the price in their own mind. Artists report that sharing photographs of work in progress on social media often generates sales from people who have been following the evolution of a work of art. Selling your art at a street fair? This casual venue has a certain vibe, and is often perceived as a marketplace where haggling is expected and deals can be made. Contrast that with selling the same work in a fine art gallery. Galleries command higher prices precisely because they know how to use their setting, reputation and presentation, combined with attracting and retaining affluent collectors who love and appreciate art. Careful research and selection will help you determine the best venues to sell at full price. Looking for an art fair or festival? The most prestigious shows are expected to have higher-end work with well-heeled attendees searching for the best. Look for shows that are a fit for your art, audience and price point, and will give you a better chance of selling more work and gaining collectors. Fair and festival reviews can be found on sites like Art Fair Insider (artfairinsider.com) or in Facebook discussion groups set up for this purpose. Walk a show first to evaluate the type of exhibitors, public attendance and the show promoter’s effectiveness. If you apply to shows just because they are conveniently located or inexpensive, they may end up being inconvenient and overpriced. You may find yourself in a low-end venue that is a poor fit, or selling nothing if the crowd is filled with bargain shoppers who won’t appreciate your work in that setting. How you display and merchandise your art or handmade work goes a long way toward conveying its value to the shopper. A cluttered display can look like a yard sale, making your work appear as commodity items and therefore less valuable. Instead, make sure your booth presents like a gallery by using good lighting, and giving each piece breathing room to stand out and shine as a special piece of art. Packaging is a part of presentation as well. What would a necklace sell for if displayed on a simple card with a hole punched in it? What if the same necklace were shown in a high-end gift box with gold foil stamping? Elegant packaging often increases perceived value. And that packaging will especially appeal to a shopper buying a handmade gift to impress. Shoppers want convenience and ease of use in their busy lives. They don’t want to worry about where to find giftwrap when they are on vacation, or how much custom framing costs. Artists who sell work that is ready to hang, ready to give as a gift or packaged to fit into a suitcase, offer incredible value to these customers, who often willingly pay premium prices for the convenience. The term “Turnkey” is defined as “complete or ready to use,” and artists can offer this to collectors in any number of ways. If your painting is on gallery-wrapped canvas, it solves a problem as a ready-to-hang option for your collector. Including a lighted base with the purchase of a sculptural work. makes it easier to display your art, and easier for the collector to say “yes” to the purchase. Selling in niche markets gives you, as the artist, the best opportunity to get the highest price for your work. When your audience is highly engaged in an interest that is reflected by your art, they are excellent prospects for you; the connection is already there between what you make and what they value. Your niche market may reflect a particular purpose, which sends prices soaring. A lidded vessel, for example, will command a certain price at an art fair, but when it’s sold as a funerary urn, the perceived value is greatly increased as the purchase becomes highly personal and significant. Some artists have literally transformed their businesses by selling in niche markets that attract customers who will pay more. Faith-based art and objects are a case in point. Churches, temples and mosques want to offer a compelling spiritual setting for worshippers, and often pay high prices for sculpture, painting or liturgical garments that create the environment and message they want to send. Do you work in a series that makes your art more collectable? Consider packaging your work as a larger unit. Some bundles are natural fits, like a set of tableware, paintings created as a diptych or several small sculptures that work perfectly as a grouping. Selling in packages and multiples increases each ticket, and boosts your total sales volume. Likewise, upselling offers tremendous value for many customers. Perhaps you offer a handmade pendant set with a particular gemstone, but others are available at a higher price. A reproduction can be custom matted and framed by the artist, or even delivered and installed in the collector’s home as an additional service. When you offer added value, mark up materials and charge for the labor involved. Cultivate Repeat and Referral Sales. The easiest sales to make are to existing collectors. They already love what you do, understand the quality and value of your art and have made the commitment to purchase. Once you’ve closed a sale, stay in touch with your customers. Reach out on a regular basis through your marketing efforts, updating them on your studio practice and sharing new art. These customers often love the fact that they have a relationship with an artist whose work enriches their lives, and they are more likely to pay full price. And they will often refer you to friends and family who may also become collectors. Attracting the right customers, increasing perceived value and growing sales volume is a reasonable goal for any artist. Take a close look at what and where you are selling. Examine your presentation and message. Then, use strategies that make shopping and collecting your work an enjoyable experience that pays you what your art is truly worth. Carolyn Edlund is an art business consultant, writer and speaker, and the founder of the “top-ten” art blog ArtsyShark.com. In her role as the Executive Director of the Arts Business Institute (artsbusinessinstitute.org) she presents professional development workshops for artists throughout the U.S. and abroad.